Monique first came to the Brunner Literacy Center in November 2013, and she soon became one of the Center's most dedicated students. Monique began her studies in the Adult Basic Education program, but quickly worked her way up to pursuing her GED® credential. Monique currently works one-on-one with three tutors to improve her reading, writing, and math skills, and on top of that, she attends five full-group GED® classes every week. She is achieving amazing successes all the time at the BLC, including earning perfect scores on her English tests. Monique has worked with lots of different tutors throughout her time at the BLC, and that variety has directly contributed to her success, in part because all of her academic skills have built on top of her previous experiences with BLC tutors. Advancement in math lessons in particular have brought Monique a steady stream of qualified tutors to help her get to the next level. 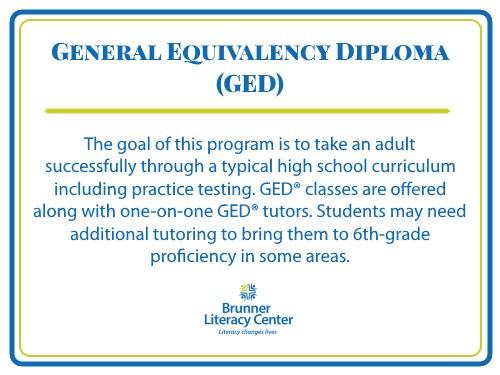 She currently works with Amy on algebra, geometry, and ratios in pursuit of passing the GED® exam. Says former Program Manager Barb Maloney, "Monique has the best grasp of the basic skills of anyone in the GED® classes." Monique has not undertaken her education alone. Her husband, Ronnie, is very supportive of Monique's studies and has helped ensure her the opportunities she needs to get ahead. Monique is an extremely persistent learner who never gives up, and family and tutor support makes all the difference for her. Coming to the BLC is like her job now, and she has no plans to discontinue her education. "When you look at her binder [of completed work] and see all the things people have put there, you see how hard Monique has worked," says Barb Maloney.